RM Sotheby’s topped all auctions during the 2019 Amelia Island Concours week in March, posting $38.1 million in sales, led by a 1965 Ferrari 275 GTB (Lot #245), which brought $2,205,000. At Bonhams’ fifth-annual Amelia Island sale, a 1914 Simplex Speed Car from the Don C. Boulton Collection of Brass Era automobiles sold for $885,000. Gooding & Company realized $22,047,980 at the company’s 10th annual Amelia Island Auction, with a 1930 Packard 734 Speedster Runabout bringing $1,765,000. And, Scottsdale-based Russo and Steele Automobile Auctions made its first appearance for the event at the city of Fernandina Municipal Airport. The weekend culminated in the 24th Amelia Island Concours d’Elegance at The Golf Club of Amelia Island Sunday. Held at the Fernandina Beach Golf Club, Bonhams totaled $16-million in sales, with an 84-percent sell-through. 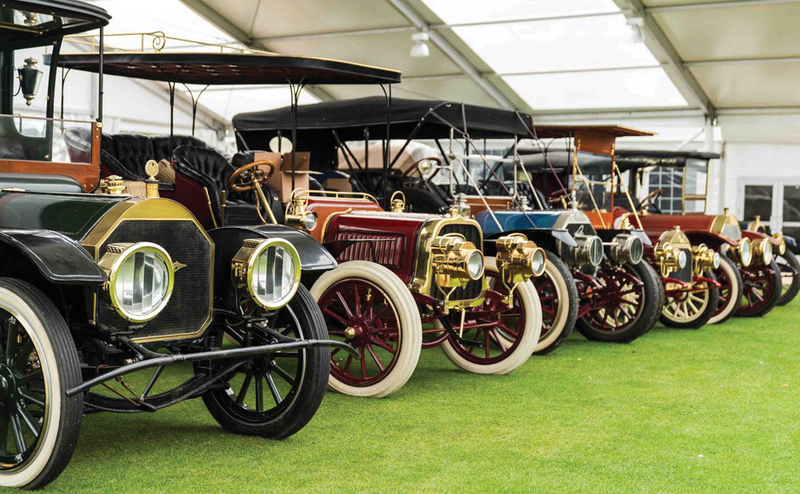 Also from the Boulton Collection, a 1904 Peerless Type 8 Roi des Belges saw a winning bid of $698,000, and $456,000 brought the famous 1908 Welch 4-L 7-Passenger Tourer to a new home. The 1968 GP-winning Brabham-Cosworth BT26 once driven by the great Jacky Ickx, achieved $1.105-million, and a 1930 Cadillac 452 V-16 Roadster, with Fleetwood coachwork, $1,187,500. “The sale shows the enduring appeal of some collector car genres which rarely appear on the market, such as the brass era and major single-seat racing cars,” says Rupert Banner, Motoring group director and auctioneer for Bonhams, with U.S. headquarters in San Francisco. At Gooding & Company, 78 of 89 lots sold for an exceptional 88-percent sell-through. A 2015 Porsche 918 Spyder Weissach, from The Jan Koum Collection, sold for $1,490,000; 1965 Ferrari 275 GTS, $1,325,000; 1963 Ferrari 250 GT Lusso, $1,226,000; 1993 Porsche 964 Carrera RS 3.8, $1,132,500; and the 1987 Kremer Porsche 962C, $1,022,500. “While we continue to see growth in the demand for modern collectibles, key sales from this year’s auction proved the desire for top-of-category classic and prewar examples,” says David Gooding, president and founder of Gooding & Company, Santa Monica. At the Ritz-Carlton, RM Sotheby’s sold 84 percent of all its lots, including a spectacular 1966 Shelby 427 Cobra (#264) with less than 1,900 original miles, which, at $1,792,500 became the most valuable non-competition spec 427 Cobra ever sold at auction. Pre-war classics had strong representation at the auction as well with a 1930 Duesenberg Model J ‘Sweep Panel’ Dual-Cowl Phaeton (#230) selling for $1,650,000, a 1934 Packard Twelve Individual Custom Convertible Sedan (#240) achieving $1,325,000, and a 1926 Hispano-Suiza H6B Cabriolet Le Dandy (#252) bringing in a strong $1,353,500. Subsequent to the sale, a 2010 Bugatti Veyron 16.4 ‘Sang Noir’ (#149) sold for $1,500,000. And, from the Youngtimer Collection, a 1994 Toyota Supra Twin Turbo Targa (#106), with fewer than 11,200 miles from new, brought $173,600.